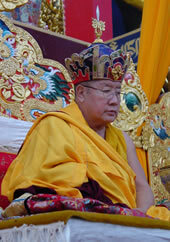 The Palyul Nyingma Buddhist Association (UK) is founded by the Venerable Lama Dondrup Dorje to preserve and propagate the two-fold teaching of Lord Buddha, mainly the scriptural teaching of Buddha Doctrine and the teaching of realisation in accordance to the Palyul Nyingma Tradition, taught by the late Holiness Pema Norbu Rinpoche. The late Holiness Penor Rinpoche (1932 - 2009) was born in the Powo region in southeastern Tibet, and was enthroned at the Palyul Monastery in 1936 as the 11th Throne Holder of the Tibetan Palyul Nyingmapa Buddhist Tradition. In 1959, His Holiness Pema Norbu Rinpoche decided to relocate to India for the sake of preserving Buddha Doctrine for the benefit of all sentient beings. Accompanied by a small group of monks, he settled in the region of Bylakuppe in Mysore, South India. In the year of the Water Rabbit (1963), under the personal supervision of His Holiness Pema Norbu Rinpoche, the Thekchog Namdrol Shedrub Dargye Ling (Namdroling Monastery) commenced its first phase of construction. Since that time, under the direction of His Holiness Pema Norbu Rinpoche, Namdroling Monastery has become the largest Tibetan Nyingma monastery in India with an ordained sangha of over six thousand monks and over one thousand nuns. Namdroling Monastery now includes numerous temples and stupas, primary schools, dratsang and shedras, a retreat centre, a nunnery, a guest house, an old people’s home and a hospital. Apart from propagating Buddha Doctrine in India and in Tibet, His Holiness Pema Norbu Rinpoche established many Dharma Centres around the world, which he visited regularly throughout his life to promote Dharma activity for the benefit of all sentient beings. His Holiness is universally revered for his loving-kindness and compassion, pure upholding of the Vinaya, the code of pure conduct and ceaseless dedication to the welfare of all beings. A long time disciple of the late Holiness Penor Rinpoche, Ven. Lama Dondrup Dorje is the Principal of the Pathgate Institute of Buddhist Studies and the Founder of the Palyul Nyingma Buddhist Association in the United Kingdom, Greece and Australia. From his Root Guru, the late Holiness Penor Rinpoche Ven. Lama Dondrup Dorje received extensive instruction on a range of Vajrayana practices, particularly that of the Dzogchen lineage, which includes Ngondro (the preliminary practice of Dzogchen known as 'Buddhahood In The Palm Of Your Hand'), Tsalung - tummo (mystic heat yoga which purifies obscuration), Togal (Leap Over - which cultivates pure vision of a realised Bodhisattva), and Trekcho (Cutting Through - which generates the recognition of naked awareness). For more information on Ven. Lama Dondrup Dorje, please visit: www.pathgate.org.